(CNSNews.com) – The United States does not support Egyptian and Emirati airstrikes against Islamist militias in Libya because the U.S. believes the crisis in Libya must be resolved politically and without outside interference, a Department of Defense spokesman said Tuesday. 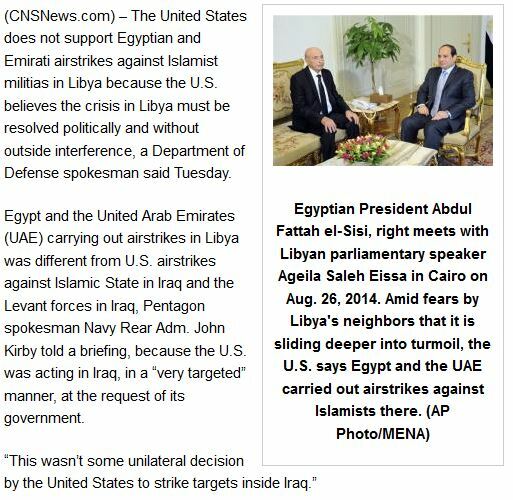 Egypt and the United Arab Emirates (UAE) carrying out airstrikes in Libya was different from U.S. airstrikes against Islamic State in Iraq and the Levant forces in Iraq, Pentagon spokesman Navy Rear Adm. John Kirby told a briefing, because the U.S. was acting in Iraq, in a “very targeted” manner, at the request of its government. He declined to “get into the specifics of our diplomatic discussions” with Egypt and the UAE over the airstrikes in Libya in recent days. Libya’s slide into anarchy has alarmed neighboring Egypt and several Gulf states, who have voiced concern that chaos there will help to spread the jihadist threat in the region. 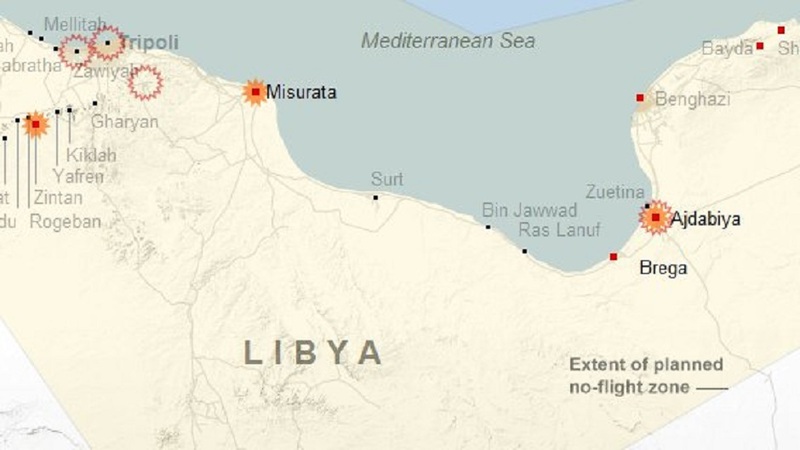 An al-Qaeda-linked group, Ansar al-Shariah, controls most of Benghazi and another Islamist faction, Fajr (“Dawn”), seized the Tripoli airport at the weekend. Qatar, whose backing for Islamists including the Muslim Brotherhood across the region has angered its Gulf neighbors, has funneled support to the Islamists in Libya. “De focus moet liggen op het diplomatieke proces” is het gekozen jargon. Dat betekent dat er niks mag gebeuren, omdat ze het zo blijkbaar wel bevredigend vinden. 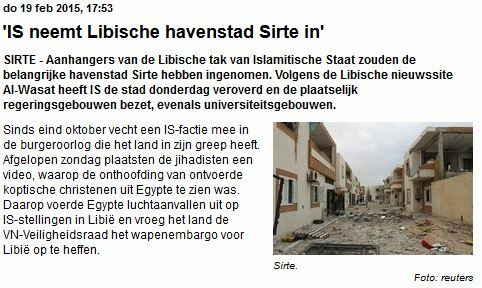 Blijkbaar is Obama supporter van ISIS, hier mogen ze niet gebombardeerd worden en in Syrië en Irak hebben ze vrij spel gekregen van deze moslimbroeder ondanks dat er voor de bühne wat onbetekenende luchtaanvallen uitgevoerd worden. Once again we see that the Obama administration just doesn’t understand the enemy we face. 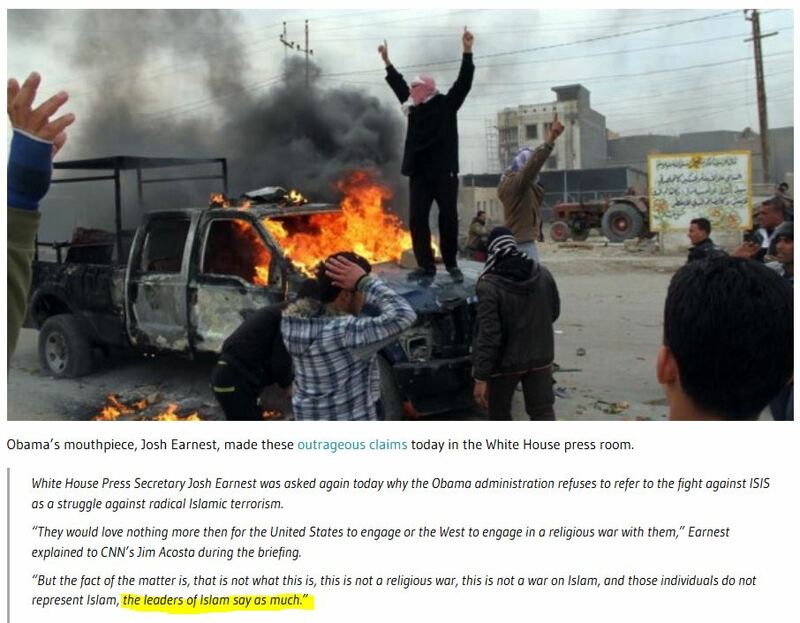 Today the White House press secretary insisted that we are not fighting a “religious war” and then he outrageously claimed that ISIS terrorists aren’t Muslims. Gelukkig zeggen ze zelf dat het niet zo IS. Fubar, heb je m’n nummer nog bewaard? Een lieftallige dame meld me dat je op dit moment niet bereikbaar bent. Sorry, ik ben geen nachtdier.